Today was a very full day. 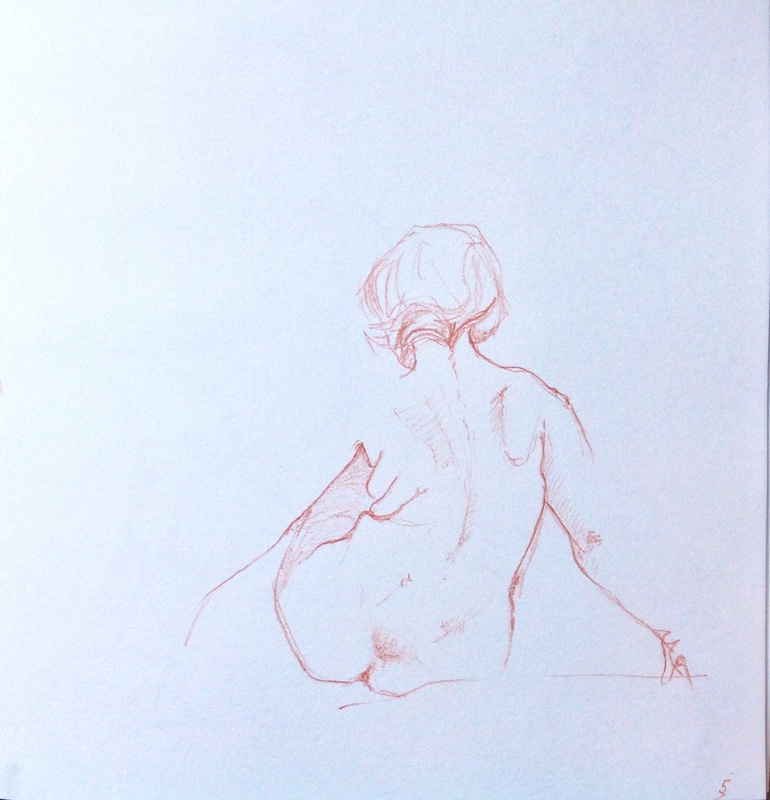 First I went to a four hour life drawing class at the Académie de la Grande Chaumière. My drawings at the Académie were kind of hard work today. As is often the case when I have a day like this, the quick five minute poses turn out the best. I horribly overworked everything else. I hurried home after class, and had a half hour to put my feet up, grqb a bite to eat, and get ready for the ballet. The sun was starting to set when I arrived and the light was catching the golden statues on top of the Opera Building. 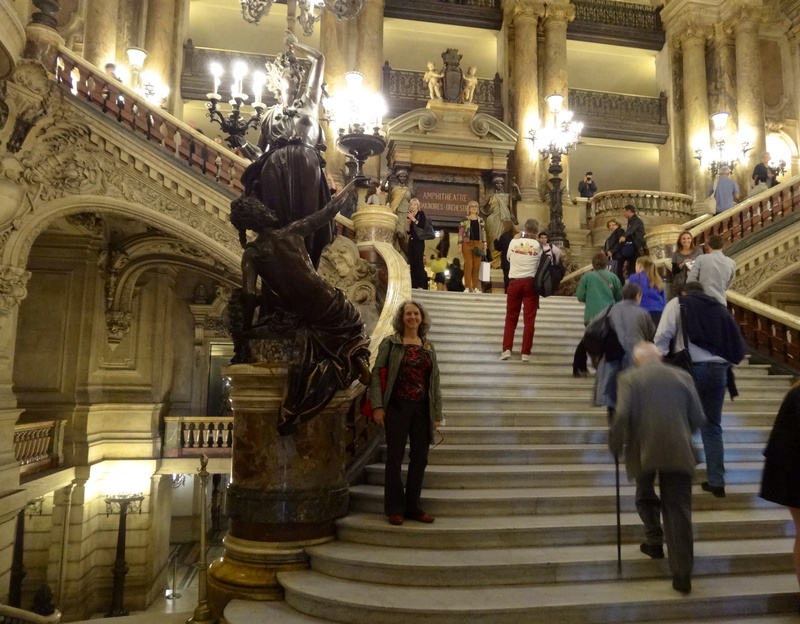 There are always a lot of people milling about, taking pictures, or just sitting on the steps soaking up the atmosphere. It was pretty neat getting to walk up to the big front doors, gain admittance, and walk up that grand staircase. It wasn’t all that easy to find my seat. Turns out it is behind a locked door with no door knob, that needs to be opened by an attendant. I am sitting in a beautiful red plush box seat! That was a surprise. I knew I had a railing in front of me, but I assumed it was just a wooden railing because there would be a walkway in front of it, or something similar. I feel rather regal, I must admit. I wonder who else has sat in that very same seat over the years? 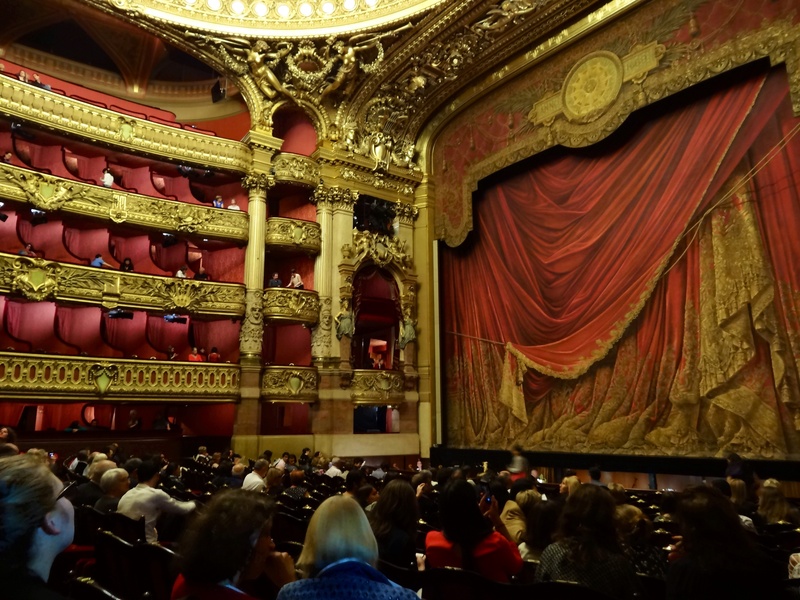 The painted curtain rises to reveal a red velvet looking curtain. 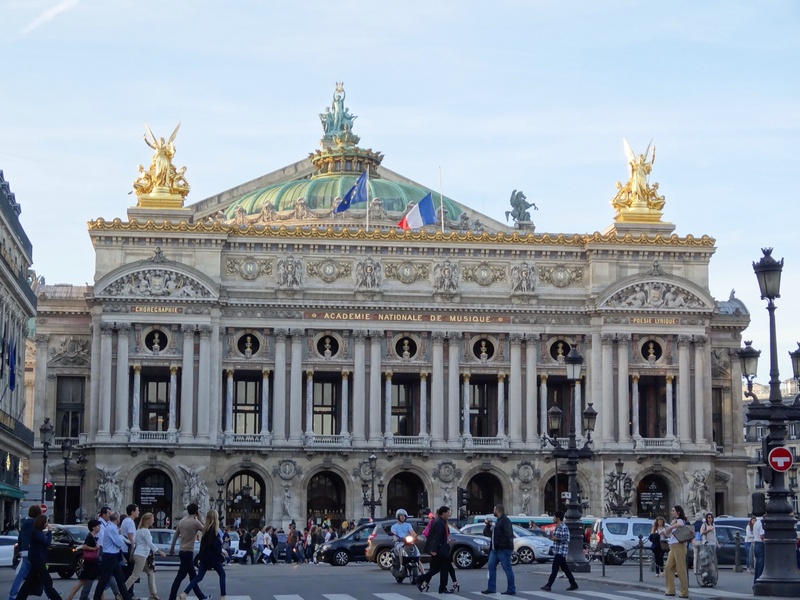 The Opera Garnier, also known as the Palais Garnier, was completed 139 years ago in 1875, and is now the home of the Paris Ballet. 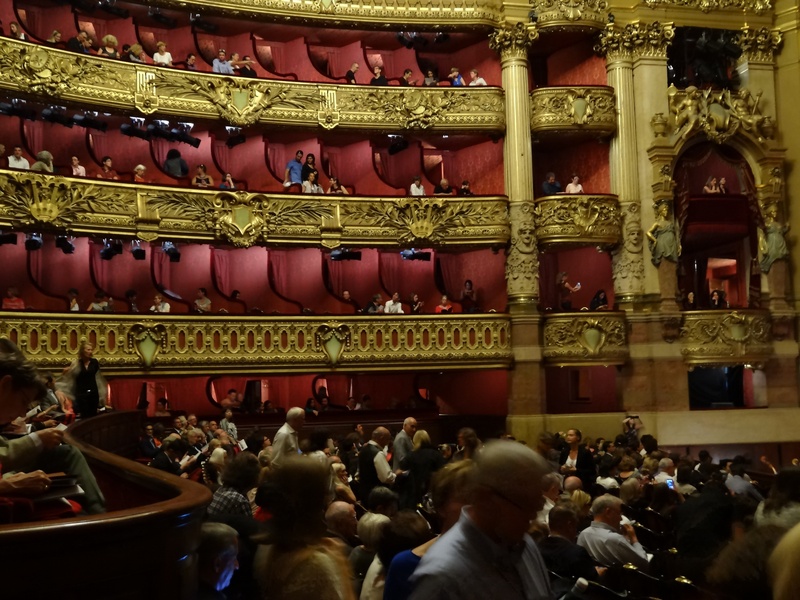 It holds about 2,000 people and is pretty much sold out most for every performance. I was very lucky to get such a good seat the day before the show, there were only a few seats left. There are benefits to travelling solo! 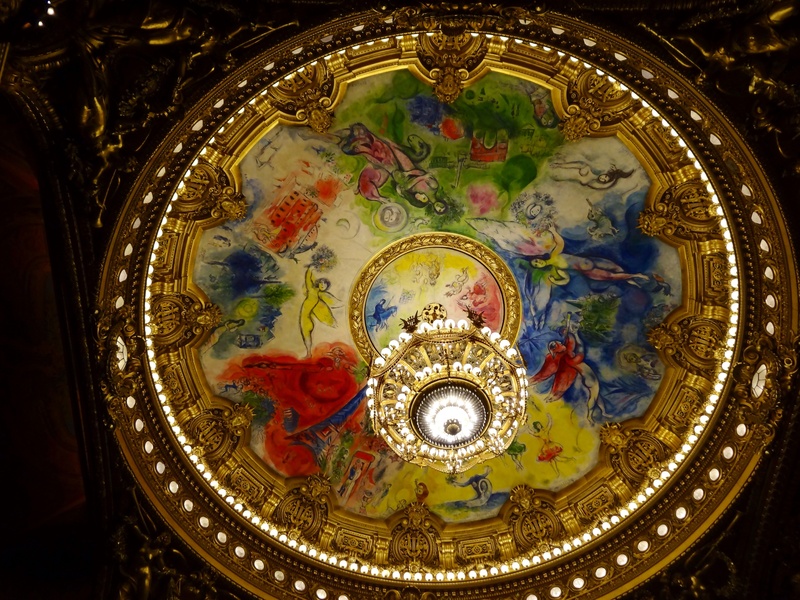 The Chagall Mural and crystal chandelier are stunning! Actually the entire place is stunning. The pictures don’t do it justice at all. I took my pen and sketchbook with me and drew in the dark. I couldn’t see a thing so I had no idea what I was doing until I could take a look when the lights came on at intermission. The first half of the performance was very traditional so there were often dancers posed in the background for a few seconds, which made it a bit easier. Although I was fairly close to the stage, about a third of the way from the stage, the dancers still looked still fairly small. I am so glad I didn’t get a seat further back. Sometimes during this performance all the dancers were on stage at the same time, quite the spectacle! The second half of the performance was very contemporary, and the dancers didn’t stop moving for a second! I was pretty sure these drawings were just going to end up as scribbles, but I think they actually still give the feeling of dancers. 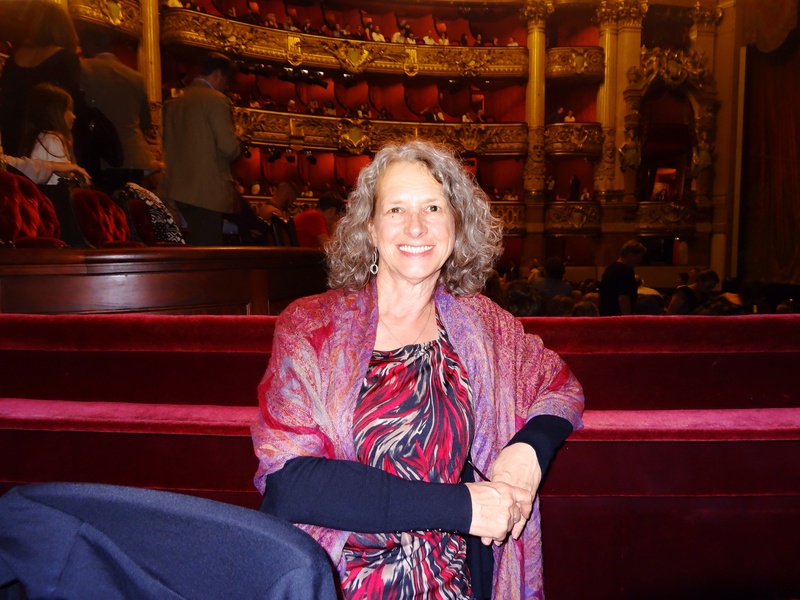 It was a great evening, watching the ballet and trying to interpret what I was seeing on paper, in the dark! 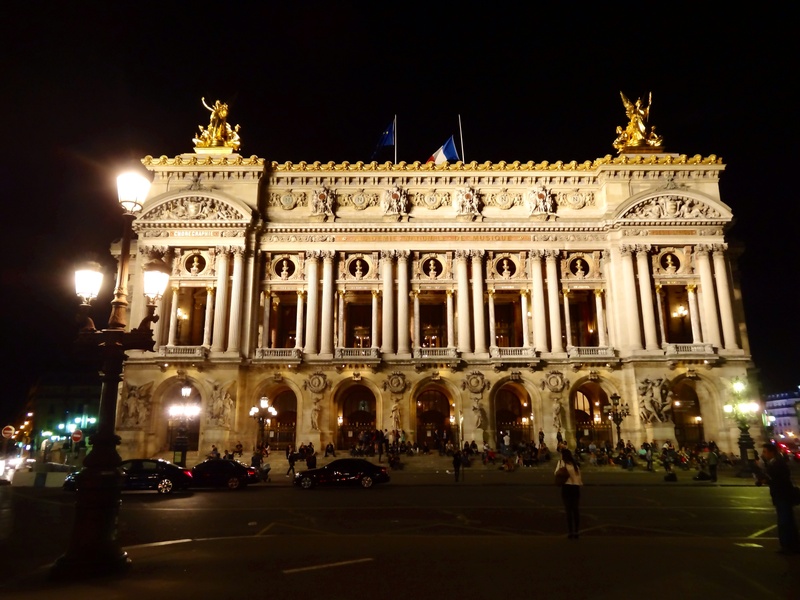 The Opera Garnier was very beautiful by night. I think I am going to have to take a bus ride at night just to see the lights of the city. 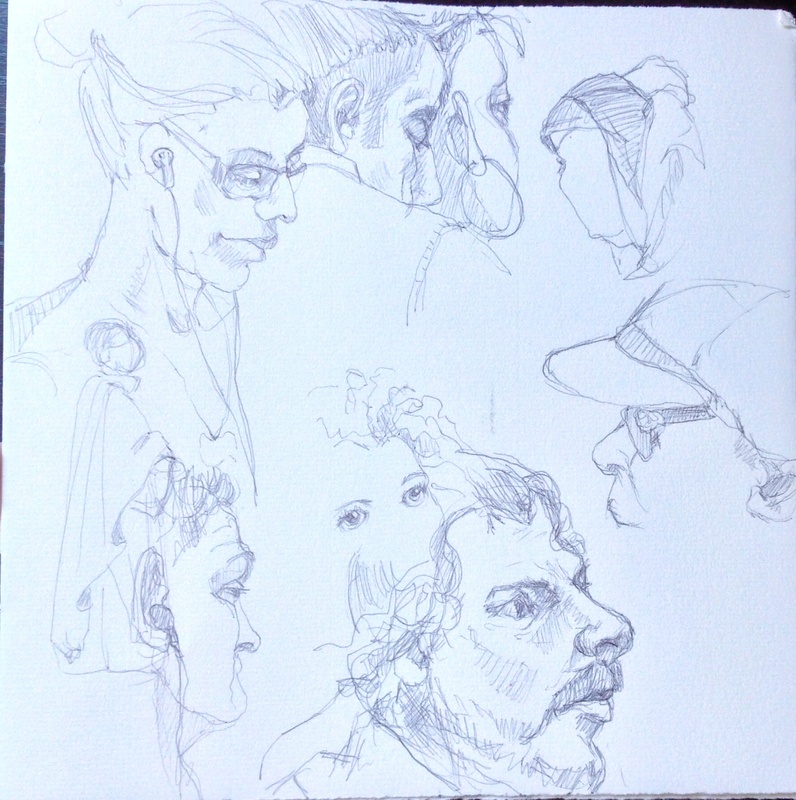 I also managed to do some more metro drawing today too, but people kept getting up and leaving. I was a bit nervous about taking the metro home so late and thought for a while about the best route to take, but it was quite all right. I didn’t get home until 10:45, definitely the latest I have been out so far. I may even try going to see the Eiffel Tower all lit up at night, now that I know I can get myself home after dark! 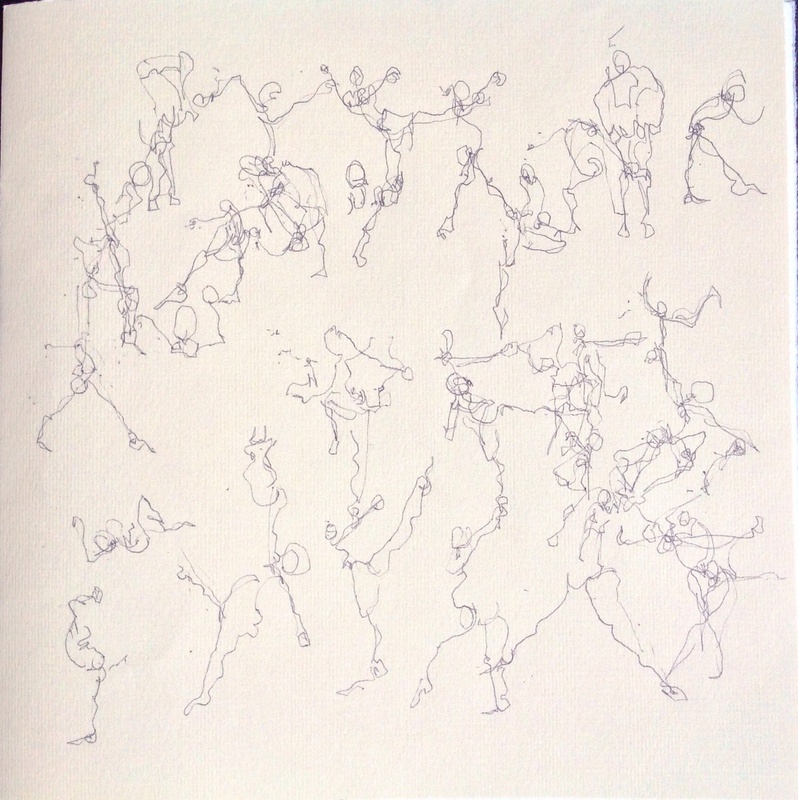 This entry was posted in Drawing, Historic Buildings, Life drawing, Paris, Paris Buildings, Paris Opera Building and tagged Academié de la Grande Chaumière, drawing, Drawing on the Metro, Lander and Forsythe Ballet, Life drawing, Opera Garnier, Palais Garnier, sketches, Travelling Alone by Trudy. Bookmark the permalink. 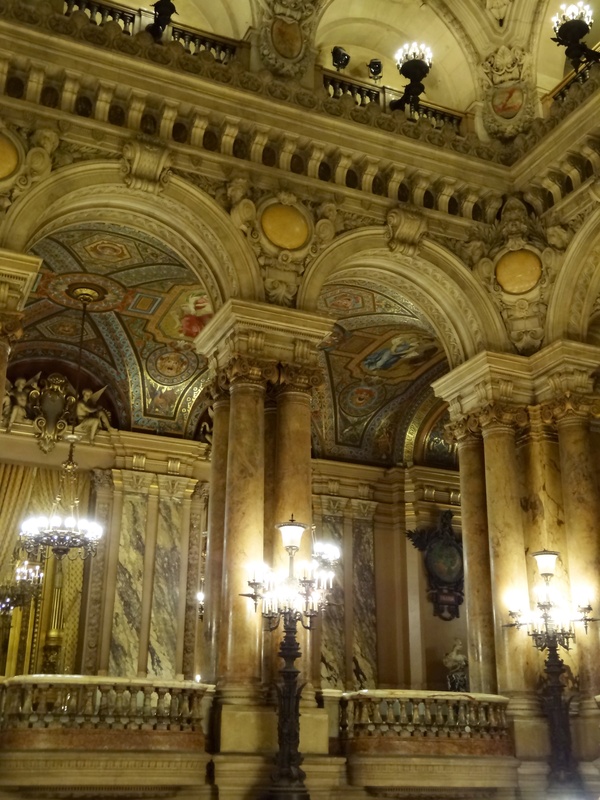 Thanks for taking us inside the Opera Building. Very regal seat! You’re welcome Kathie, it was quite the experience. I love all the twirling ballet dancers. So lucky to have been able to go to this. Me too, the squiggles made me giggle ~ what a beautiful building. I know, it was a bit expensive, but definitely worth it. What a regal, memorable, priceless experience to treasure for the rest of your life. You are right about going solo can often be a benefit in finding one seat available. Thanks for allowing us to feast our eyes upon your festive outfit. I’m glad you had fun drawing in the dark but I think your best work is done in daylight. I applaud you for your joie de vivre! 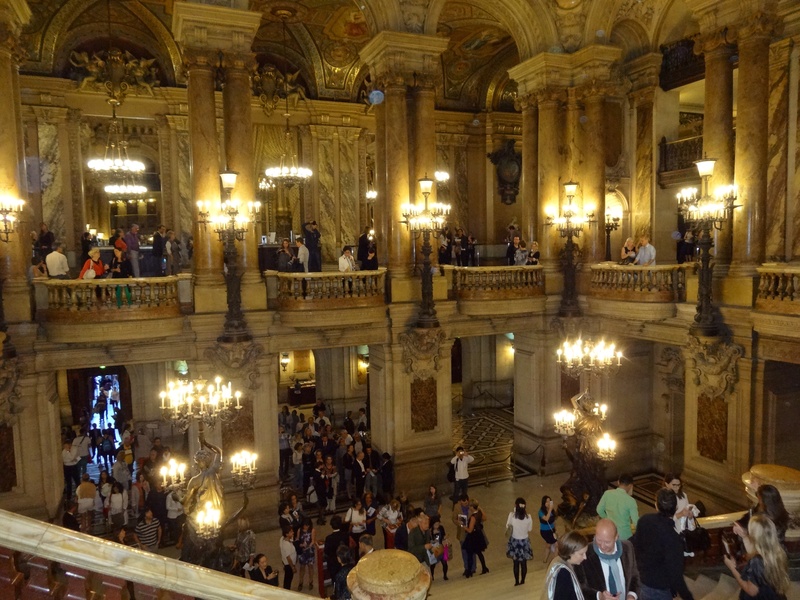 It was a lot of fun, drawing, watching incredible dancers and listening to the orchestra. You are right, I won’t soon forget it.